MH Newsdesk WordPress Theme is ideal for fresh and dynamic news websites and comes with great flexibility. After you have installed the theme to WordPress, you can follow a few simple steps to configure the theme. In case you are new to WordPress, we recommend you have a look at a few basic WordPress tutorials first. A good place to start is the WordPress Codex: Getting Started with WordPress. Now have fun creating amazing websites with MH Newsdesk. In case you want to configure your site like the theme demo, you’ll need to create a static front page first and then place the widgets on the front page. To set a static front page with the widgetized layout, please create a new page with name “Home” (or anything else) and select “Homepage” as template. Then please navigate to “Settings => Reading” in your WordPress dashboard and set that page as static front page. If you need more help with creating a static front page in WordPress, please read and follow this tutorial: How to set a Static Front Page in WordPress. MH Newsdesk WordPress Theme has in total 14 locations where you can place WordPress widgets, custom widgets or add any HTML code you like. When you have completed the setup of your static front page (as stated above), you can navigate to “Appearance => Widgets” in your WordPress dashboard and easily drag & drop widgets in the specific widget locations. You can simply drag & drop widgets in widget locations / sidebars when you navigate to “Appearance => Widgets” in your WordPress dashboard. 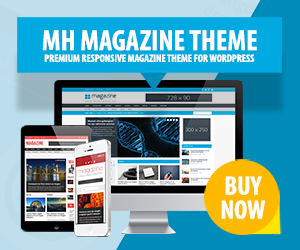 There you will find an extensive collection of default WordPress widgets and custom widgets that are included in MH Newsdesk WordPress theme, like for example: MH Custom Posts, MH Custom Pages, MH Posts Grid, MH Recent Posts, MH YouTube, MH Authors, MH Facebook Likebox and more. Usually WordPress themes have defined their own image dimensions and thumbnail sizes. These thumbnails are automatically generated by WordPress when you upload an image. When you change your WordPress theme, it can happen that the thumbnail requirements of your new theme do not match the sizes of the available thumbnails in your media folder. If that’s the case, your thumbnails won’t look consistent in size and you’ll need to regenerate your thumbnails. MH Newsdesk WordPress Theme will use featured images for the thumbnails on archives and in the custom widgets. If you have already uploaded images to your site or added images manually to your posts and if these images don’t appear as thumbnails, please read and follow this: How to use featured images in WordPress. You can not only select your favourite font from a collection of most popular Google webfonts in the theme options panel under “Typography”, but you can also easily change the color scheme of your theme with a few simple clicks by using some awesome colorpickers. We have extended the basic color options of WordPress under “Appearance => Customize => Colors” in your WordPress dashboard with some new options to change the colors of your theme. Just check it out and create your favourite color scheme. MH Newsdesk WordPress theme has already a built-in box with related articles below the content on posts. These recommendations are based on tags. So if you want to use this feature, please ensure that you have tagged your posts. As soon as tags match, articles will be recommended in the “Related Articles” box. To display social icons in the header, you’ll just need to create a custom menu with custom links to your social media channels in your WordPress dashboard under “Appearance => Menus” and assign this menu to the “Social Icons” menu slot. The theme will automatically recognize the social networks based on their URLs and display the specific icons. Currently the following networks are supported: Behance, Dribbble, Facebook, Flickr, Google, Instagram, LinkedIn, Pinterest, Reddit, Soundcloud, Tumblr, Twitter, Vimeo, Xing and YouTube. The theme has included a “Contact” page template with an additional sidebar to display a different sidebar on your contact page than on other posts and pages. If you use this template for your contact page, you could for example place the “MH Facebook Likebox” widget and a text widget with your contact details in the “Contact” widget location under “Appearance => Widgets”. MH Newsdesk WordPress Theme also supports the popular “Contact Form 7” plugin to easily create working contact forms with only a few clicks. Please read this to learn more: How to create a working contact page in WordPress. In case you want to use shortcodes to easily add styled elements like tabs, columns, boxes, accordions or else to your website, we recommend the “Shortcodes Ultimate” plugin. This plugin has included tons of useful shortcodes to easily customize your website. You can find more information and the documentation on the plugin site. If you want to learn more about WordPress, MH Newsdesk WordPress Theme or want to read additional tutorials, please have a look at our support center.